FOSTER UPDATE: Answering to Maggie, [Megan] comes when called, loves attention and praise and likes to be first at petting time. When confronted with something new, Maggie needs encouragement to boost her confidence. She loves people & kids, but is learning not to jump with her excitement. Maggie is not small dog/animal compatible. She is cautious about loud noises but does not run away. Maggie has embraced car rides, barks moderately, and is house trained using a doggie door. She is not crated. While walking zig zag style, she does not pull on the leash. Alert at the sight of rabbits, a firm yank on the leash and the command ‘leave it’ brings her into line. Maggie is open to grooming but cleaning the ears needs work. 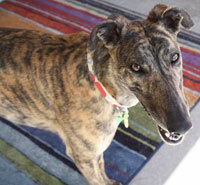 She would do best in a home where people are around frequently or she has another dog for companionship.